So what's the deal with the KHR-3, what of the supplied documentation/software is in English and what isn't? please, please .....where is the english software...and manual!!!!! Any news on this? I have a KHR-3HV right waitin in my Robosavvy cart, but I won't complete the order until the english SW/Manual are available. KHR-3HV English documents and softwares. The documents and softwares for KHR-3HV has been translating into English. We will inform when we have completed it on this page. We have just received the news from the Manufacturer that the English Manuals for KHR 3HV and H2H 4 are being released this week. H2H 4 software is still in Japanese but with the English Manual you will finally be able to make full use of it! Since HTH4 is a .NET application I was able to extract some of the resources from the Japanese version and translate some of it to English. Things like the drop down menus, some messages and prompts, and toolbars. Last edited by chrisvo on Sun Jan 03, 2010 7:22 am, edited 1 time in total. Do you have the files and (maybe) some setup instructions that you could share with us? BTW: out of topic, the screenshot is for a windows xp running parallels right?? I'm running Windows XP in VirtualBox on Linux. Another bit of information missing are instructions on changing the IDs on servos. Because servos are now in a daisy chain, each servo has an ID. If you want to customize your robot with more DoFs (lets say > 22) you need to get more stand alone servos (that come with a default ID) and reprogram their IDs to unique IDs on your chain. The procedure to this is also unknown at this time. (this does NOT affect however the 5 Servo Expansion set for KHR 3HV. This expansion set already has all servos pre programmed with the correct IDs so it works perfectly fine). Commands appear to be 4 bytes long. Kondo has finally released the English Documentation for KHR 3HV. The documentation currently available includes the KHR 3HV Users Manual and the Heart to Heart 4 Users Manual. We are not authorized to distribute the manuals publicly at this point but we are suppling them - privately - to all future customers who purchase a KHR 3HV as well as previous customers who have purchased a KHR 3HV from us (Robosavvy). I made a bit more progress in the translation of HTH4 to English. Was able to modify in the assembly code. So I got the project settings dialog finally translated! Last edited by chrisvo on Sat Jan 02, 2010 1:30 pm, edited 1 time in total. I just finished translating HTH4 into English. 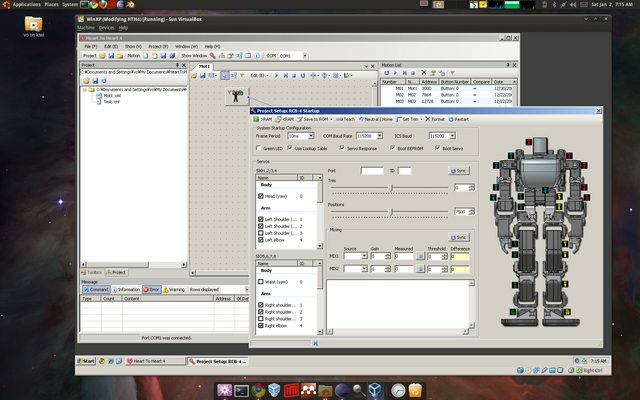 It's 99% complete except for the 15 toolbox description texts because it appears that the program uses those descriptions in the motion files and HTH4 crashes upon loading the motion files because it can't find the tools that the motion files refer to. This would make it hard to load up the bundled motions, so I left the description texts alone. I would really like a copy. I have been trying to get by with the Japanese version but have real difficulty with the error messages - which I get lots of. It must be legal to give this to people who have bought a legal version of H2H 4. Perhaps Pedro can distibute via email to those that have purchased from Robosavvy?????? With regards to distribution via email, I' am afraid I can't do that without Kondo's permission. HOWEVER, what I believe can be done (and is legal) is just distributre the Resource Files (no EXE or DLL files). 1) Distribute ONLY the modified files. This can be considered "derived work" because the files you modified have "your" work in them. You have the rights to all work you do so I think it should be ok. If you don't distribute any original files (which are Kondo work) I think there should be no problem (including the EXE files for HTH4). 2) Write some instructions about how to apply the files to an existing HTH4 installation. For your information we have made publicly available a subset of the instructions manual (sample) for KHR 3HV and HTH4. Once again, only people who purchased the robot are entitled to have the full manuals. Kondo expressly forbids public distribution of these manuals.